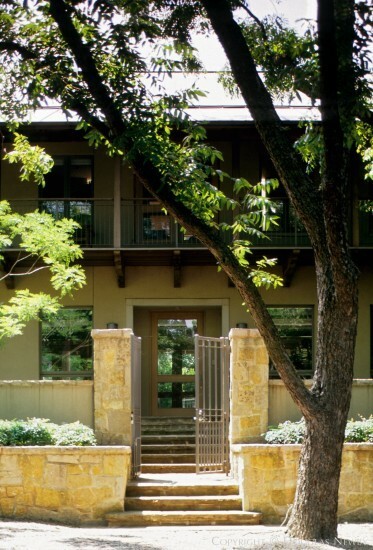 This home overlooking White Rock Lake, was designed by Frank Welch in 1997 for John and Barbara Bradfield. It draws directly from O'Neil Ford and David Williams. The balconies evolved directly from O'Neil Ford's Trinity University in San Antonio. It has vertical steel straps and a wood cap railing. The egg crate redwood grid frames a screened in porch in much the same way as O'Neil Ford treated the porch on the Wendover home designed in 1939. This White Rock Lake home is built on a controlled site, exposed with very beneficial view on all four sides. A tall screening wall of stucco with a stone cap was installed to simultaneously maintain and enhance the views. On the public side the screening wall mitigates the house while the private side becomes a graceful garden wall with an elevated grade. The home is sublimated to the site. The stucco and stone of the home is of equal weight so the home recedes into the landscape. Existing trees were preserved and volunteer trees were encouraged. This home also reflects the character and personality of the clients who are generous with the community with charity events or architectural tours, and passionate about music, cooking and entertaining for a few friends. Reflecting Texas and modernism, the home is warm, honest, sleek and takes advantage of contemporary materials and technology.